As the first luxury hotel opens on Easter Island, Michelle Jana Chan reports from a location that's not as isolated as it was. I wondered if the pilot sighed with relief as the wedge of land emerged on the horizon. There is only deep Pacific Ocean blue between Santiago, the capital of Chile, and Easter Island, and, after five hours in the air, the cones of three extinct volcanoes rising from the sea are as welcome as they are dramatic. They must have been even more of a surprise for the 18th-century European explorers who stumbled across this craggy outcrop, especially when, on closer inspection, the adventurers spied the forbidding backs of giant stone statues standing sentinel along the coastline. Captain Cook wrote in his journal in March, 1774: "This is the farthest we have come." The real miracle is that the first settlers, the Rapa Nui, believed to have arrived from other Polynesian islands around 400AD - and from whom the island takes its indigenous name - ever made it to these rocky shores. The nearest inhabited land is Pitcairn, nearly 1,250 miles to the west. In the other direction, at almost twice the distance, is Chile, which annexed the island more than 100 years ago. When I stood on Maunga Terevaka, one of the volcanic peaks and the island's highest point, could I really be seeing the curvature of the Earth? That's what the locals told me. Not that Easter Island is that isolated any more. There are scheduled flights from Chile most days, and more than 40,000 tourists visit each year. Visitors are mainly backpackers checking off the world's must-sees, or retirees on a do-before-you-die mission. Few stay more than a couple of days, holing up in basic guesthouse accommodation and hiring a car or a guide to see the sights. The occasional cruise ship passes, too, shuttling passengers to shore for group tours. But last month's opening of the first luxury accommodation will attract a different class of traveller. Santiago-based Explora, a group known for its remote, top hotels in Patagonia and the Atacama Desert, has built a sleek new property on the south coast. It is a stylish, all-inclusive retreat, complete with swimming-pool and spa, but as at Explora's other hotels, guests will be encouraged - with bilingual guides and extravagant picnics - to venture beyond the hotel's grounds. Persuading them should be easy. Almost all tourists who make the long journey here have their hearts set on seeing the moai - the local name for the hundreds of sculptures, carved from basalt and tuff (consolidated volcanic ash), that are scattered across the island. I had seen images of these enigmatic figures so many times that the silhouette was strangely familiar when I saw my first statue at Ahu Tahai, outside the island's single village, behind the scuba diving centres and close to the Christian cemetery. Here was one giant, solitary figure, heightened further by the regal stone top-knot balancing on his head. The features that seem smudged on the television screen are more chiselled in real life, the jaw bolder. His eye-line soared above my head and he cast a long shadow over me as the sun set behind his broad shoulders. Between the 10th and 16th centuries, the Rapa Nui - Polynesians known for their sophisticated architecture and complex hierarchical society - cut the moai out of the flanks of the island's eastern volcano, Rano Raraku, where a particular type of dark compressed ash is found. Today, half-carved moai are still visible in the rock. Some are barely noticeable, highlighted only by the curve of a brow, the elegant line of a half-finished torso or an upturned nose. Once finished, the figures were probably transported in much the same way as the monoliths of Stonehenge, using log rollers and traction, along Ara O Te Moai, or the Path of the Moa, which runs several miles westwards. Down the slope, dozens of moai can be seen lying fallen, mostly head-first, balancing on their strong jaws. The landscape resembles a battlefield or a neglected graveyard. From here, statues were carried to the perimeter of the island, up to 10 miles (16km) away, over undulating hills that in those days would have been covered in trees. Some of the biggest never made it, including one known to locals as Gigante, 72 feet (22m) long and weighing 160 tons. Archaeologists are still not sure why the artisans laid down their tools and abandoned the tradition of building moai, which are believed to symbolise authority and power, and to have been erected to honour the important ancestors of the clan. Easter Island offers few definitive answers. The various guides who accompanied me around the island usually began their narratives with: "There are three versions to explain this..." Making up your own might be equally plausible. One of the deepest mysteries lies in the museum, where four wooden tablets, etched with a script called Rongorongo, are protected by a glass cabinet. No one has deciphered the hieroglyphs, which are the only evidence of an ancient written language ever found in Polynesia. "Actually, this is the only real mystery left on Easter Island," Francisco Torres Hochstetter, the museum's director, told me. This might be so to an academic eye, but for the curious visitor there is still plenty to puzzle over. There are gigantic ahus, or ceremonial altars, as well as cave paintings, and squat stone structures thought to be ancient observatories. Designs of birds, fish and fertility symbols are beautifully etched upon the volcanic rock, and the same patterns are tattooed on the golden skin of many of the local people. Like so many skilled civilisations, that of the Rapa Nui eventually declined. Some say it was after they cleared the land of the dense forest, causing soil erosion and crop production to fall. Inter-clan fighting broke out, which is when many of the moai were toppled. Famine ensued. There was not even enough timber left to build a canoe and flee. Hundreds of years later, the island is still largely barren. Unlike other lush Pacific islands, Rapa Nui is made up of rocky terrain, lava deposits and rough scrub. Thousands of semi-wild horses gallop across the island's wide open spaces, but there are few other animals or birds. Yet for a Polynesian island with few palm trees and beaches, Easter Island is firmly planted on tourists' maps - and in their imaginations. With Explora's new hotel, they will now be able to enjoy the adventure in some serious style. The hotel itself, designed by the Chilean architect José Cruz Ovalle, appears almost to have been carved into the rock face, rising and falling in line with the soft curves of the hills. Its subtle integration into the landscape is offset by its startling black finish of volcanic lava, echoing the island's lattice of dry-stone walls (built by the British when they rented the land for sheep-farming). The hotel might lie low, but it offers broad vistas of the southern coastline. On a clear day you can see Tongariki, a line of 15 striking moai, several miles away. Being small and boutique in style - with only 30 rooms - the hotel will barely affect the number of tourists. That will happen only if the number of scheduled flights increases - and if the islanders want it. Some believe there are enough visitors already. "We don't want to destroy the peace," said Edgar Herveri, president of the Chamber of Tourism. "That's why tourists come here in the first place." Of the 4,000 people who live on Easter Island, almost all earn their wages through tourism. They live clustered together in the one town, Hanga Roa, with its post office, one ATM and pharmacy. It hardly feels congested, but local people are concerned about how to protect their culture and the moai, which are a Unesco World Heritage Site. I regularly saw tourists clambering over stone altars, despite signs asking them not to, and even found some initials etched into the rock face. Visitors without a guide can miss the petroglyphs, faint now with erosion, and accidentally trample upon this ancient rock art. 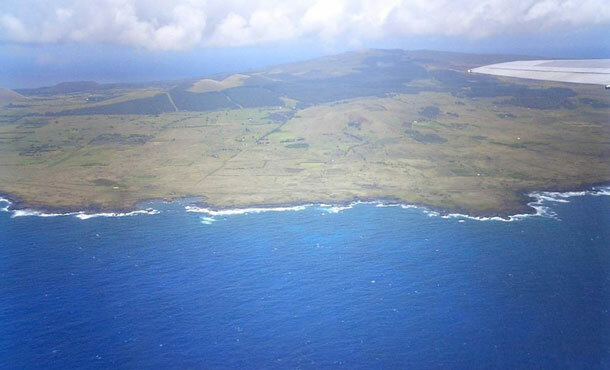 Until now, Easter Island's remoteness, and its limited infrastructure, has been its defence. But a number of smart hotels are under construction, and more regular flights are expected. Only the Rapa Nui people - and the conscientious tourist - can protect this peaceful Polynesian outpost.